Doors open at 7 p.m. and the reading begins at 7:30 p.m. Poetry is free and open to the public. April 16th Poetry + presents Kevin Latimer. 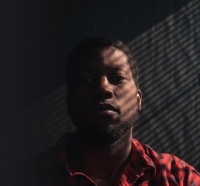 Kevin Latimer is a poet and playwright from Cleveland, Ohio. He is a Co-founder & Co-Editor-in-Chief of BARNHOUSE. His work has appeared in or is forthcoming from FEELINGS, TRACK//FOUR, A VELVET GIANT. His one act play, 4 BLACK BOYS 2 B ASTRONAUTS debuts with The Manhattan Project in the summer. Art On Madison Gallery is located at 14203 Madison Avenue.